Wind can wreak havoc on many roofs. At Denver Roofers we are wind damage roof repair and replacement experts. Since 1994, we have been helping people restore their wind damaged roofs to their original condition. Denver Wind DamageEvery year in Colorado countless roofs need repairs due to high wind damage in Denver, CO and the surrounding metro areas. For over 25 years our expert repair technicians at Denver Roofers have assisted homeowners after major Colorado wind storms. Our expertise has trained us on how to find and repair the damage that safeguards the integrity of your roof for years to come. Colorado is home to some of the windiest weather in America. Wind damage is a leading cause of property damage in the state, causing homeowners and insurance companies millions of dollars in costs every year. Wind gusts are sometimes strong enough to tear shingles from roofs and break tree limbs off, making your roof susceptible to major damage from leaks or structural damage. Some types of wind damage are easily seen, but sometimes there is damage that is not easily detected. Damaged flashings and torn shingles may not be noticed until you experience a leak in the roof, or the damage becomes larger. Our roofing inspectors will be glad to visit your home and inspect your roof for any wind damage. 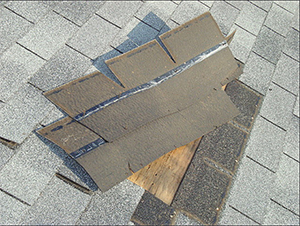 Torn Shingles – wind tears shingles from roofs and will scatter them around your home’s landscaping. If you find a shingle this is an definite indicator that your roof has experienced wind damage. However, you may have wind damage even if you don’t find a shingle on the ground because wind damage can be shingles that are knocked out of place and not protecting the roof structure. Fallen Tree Limbs – wind can also tear branches from tree, launching them onto your roof creating holes, denting flashings, breaking tiles, and tearing shingles. Debris Build-up – accumulated debris can block your gutters preventing proper drainage, raising water back onto your roof and penetrating underneath the flashings where it leaks into your home. The majority of asphalt shingles carry a wind resistance rating of 60 miles per hour as tested under ASTM 3161 or UL 997. Specialty shingles can be rated as high as 130 miles per hour. A higher rated shingle will probably perform better than a lesser rated one. Shingles rated at over 100 mph are in many cases special order items. A wind resistance rating should not be confused with a warranty. Wind resistance warranties usually require that the shingle tabs be securely sealed to the adhesive strip and most manufacturers limit wind coverage to 5 or 10 years from original installation. If there have been high winds in your area, and you need roofing repair, call Denver Roofers at 303-781-8185 to have a professional roofing contractor inspect your home or business roof. Denver Roofers offer a free roof inspection, evaluation, and estimate regarding wind damage repair, and insurance claims.